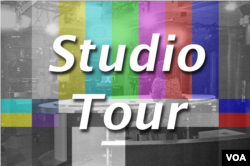 The Voice of America Studio Tour is a behind-the-scenes look at live broadcasting in radio, television, and the Internet in several of our more than 40 languages. Click here for more information. ​The Voice of America began broadcasting in 1942 to combat Nazi propaganda with accurate and unbiased news and information. Ever since then, VOA has served the world with a consistent message of truth, hope and inspiration. Learn more about VOA's history here.